The jack-up vessel, INNOVATION loading the first tripod for the Global Tech I wind farm. The jack-up vessel can be loaded with three 950t tripods and nine 60m long poles at a time. The wind farm is equipped with 80 AREVA M5000 wind turbines. GTI is owned jointly by HEAG Sudhessische Energy (24.9%), Nordererland Projekt (10.05%), Stadtwerke München (24.9%), Esportes Offshore Beteiligungs (ten percent), EGL Renewable Luxembourg Axpo (24.1%) and Windreich (16.05%). Construction started in August 2012 and was completed in August 2014. All the turbines were installed by this time, while commissioning is expected to start once the grid connection is available in the final quarter of 2014. The project is estimated to generate 1,400GWh of power per annum, which is enough to serve 445,000 houses in the region. It is capable of generating enough power for one million people. The total estimated investment on the project is €1.6bn ($2bn). By July 2012, its developers had invested €1.1bn ($1.4bn) on the project. The wind farm is built across a 41km² offshore site in water depths ranging from 38m to 41m. It uses 80 AREVA M5000 wind turbines rated at 5MW each, which are well-established and tried-and-tested for offshore wind farms. The turbines have a rotor diameter of 116m, hub height of 90m and total height of 148m. INNOVATION, a jack-up vessel with 8,000t lifting capacity and fully automatic crane, was used to load, transport and install the wind turbines at the GTI offshore wind farm. The vessel can transport three tripod foundations and nine 60m long poles at a time. In September 2012, the first three tripods were loaded into the vessel for installation of foundations. Five test piles have been successfully installed at the site. Installation of the first medium voltage cables began in February 2013. Installation of the first AREVA M5000 wind turbines started in September 2013. "Construction started in August 2012 and was completed in August 2014. The project will generate 1,400GWh of power." Output from the Global Tech I offshore wind farm will be transmitted to the onshore national power supply grid through high-voltage subsea cables. The cable work was in progress as of August 2014. An underwater robot is being used to check whether the 120km of internal cables are positioned properly at the right depth in their seabed trenches. Two grid connection points are being established with two transformers at each point. The BorWin Beta substation will be offshore while the Diele substation is being built at onshore. Turbines will be connected by 33kV inter array cables and power will be transformed to 155kV at the Global Tech I substation platform inside the wind farm. From there, power will be transported by the grid operator TenneT to BorWin Beta. As an interim solution it is expected to transport power to the already existing transformer station BorWin alpha. TennneT plans to connect the offshore wind farm to BorWin beta in September 2014. AREVA, a public multinational industrial conglomerate, was awarded the supply and maintenance contract for the wind turbines. ABB will supply medium-voltage frequency converters for the wind farm under a sub-contract with AREVA. "It is capable of generating enough power for one million people." HOCHTIEF, a construction company, signed a contract for the construction of foundations and installation of wind turbines in September 2010. A consortium of Norddeutsche Seekabelwerke and Global Marine Systems was awarded with the cable production and the infield cabling. Prysmian and Siemens were awarded the contract by TenneT to install offshore cable connections for BorWin Beta in June 2010. The grid connection is the responsibility of the grid operator TenneT. Cathy Associates was selected among others to provide geotechnical services during the geotechnical site survey. The company was responsible for assessing soil conditions and design methods. A consortium of Alstom Grid and Keppel Verolem has delivered a self-floating and self-installing substation platform for the project. It is responsible for the installation, erection and commissioning of the offshore substation. The project owners have raised a debt of $1.2bn from a consortium of 16 commercial banks, including European Investment Bank (EIB) and KfW. The shareholder of the project additionally raised approximately $1bn of equity for the project. The consortium of commercial banks has contributed a loan of $347m, while EIB provided a direct loan of $128m. EIB also provided $514m as subsidised loan guarantee for the consortium. 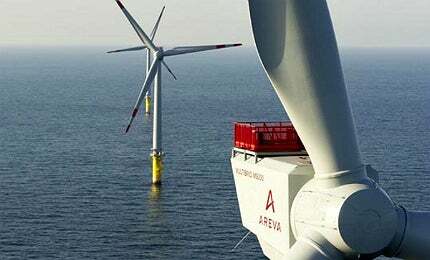 Alpha Ventus Wind Park is Germany’s first offshore wind farm. The facility is located 45km north of Borkum island in the North Sea. How the next phase of wind power generation is set to be cheaper and more efficient. Baltic 1 Offshore Wind Farm is Germany’s first commercial offshore power project located in the Baltic Sea.